FRESNO -- As Kristin Fahy approached the spot near the end of the course, she saw coach Bill Vice standing there, encouraging her. It exactly the same as a year ago, yet totally different. "I saw coach there screaming at me and I thought, 'I'm not stopping today,' " said the La Costa Canyon senior. "I'd already experienced the worst-I had nothing else to lose." Actually, the superstitious Vice had moved closer to the finish line by a few yards and when he saw her this time, he knew the outcome would be better. Flash backward to last year's California State Cross Country Division III championship race at Woodward Park. Fahy had total control of the race at the 2-mile mark and was leading her school and team to its first-ever championship. With about a half-mile remaining, she saw her dad and the look on his face said it all. She was struggling. Still well in the lead as she approached Vice with about 250 meters remaining, she collapsed. He urged her to try to get up but when she tried, another runner knocked her back down. She would never finish the race. Although Fahy refused to be transported to the hospital and bravely took the victory stand with her teammates to accept the third place trophy, she was devastated. To this day she has no idea what happened. Trying to run in the Foot Locker Western Regionals at Mt. SAC a week later, she was among the top six going up the final hill and stopped. This time her IT band was so painful she could not continue. Many wondered if her running career was over but a sizzling 10:16.45 fourth place in the 3200 at the State Track Meet muffled those whispers. Still, running over the same course, those who were aware of what happened a year earlier held their breath as she again passed the 2-mile mark Saturday with a 17-second lead after moving up to Division II. "When I saw her come around that corner, I knew she had it," said the veteran Mavericks coach. "This time she was strong the whole race and she even had some left. Every one of our runners improved, so I told them by how much and when I got to Kristin, I told her 'you improved 17 minutes, 22 seconds.' "
Even the announcer got in the act, filling in the crowd with these words as she came to the line: "what a great comeback-Fahy is going to win her state championship." She heard those words and smiled as she crossed the line first in 17:22.6-a full 22 seconds ahead of runner-up Maddie Coles of Claremont and the third fastest time of the day. About the only thing she couldn't control was the team race where the Mavericks placed fifth behind defending champion Claremont. Their combined time of 1:32.46 would have won Division III by six minutes. With her victory, though, Fahy delivered the first-ever brother-sister championship, following Darren's Division II victory in 2011. "I didn't know that," said Fahy while accepting congratulations from dozens of runners, parents and coaches. Asked about the race this year, she gave a descriptive narrative. "I didn't plan to go out too hard (it was a 5:29 mile). I wanted to save a little for the end," she said. "I wasn't worried about last year-I'd never had run that race before or after. I felt so much better than last year. Although I was ahead last year at two miles, I was starting to feel whatever it was. I knew I was losing it then. "This time I felt strong. I felt in complete control and knew I was ahead and feeling good. There was no comparison." She had been thrilled to see her boys teammates finish 4-5-9, which she said fired her up even more. The fact she had won at Stanford, Mt. 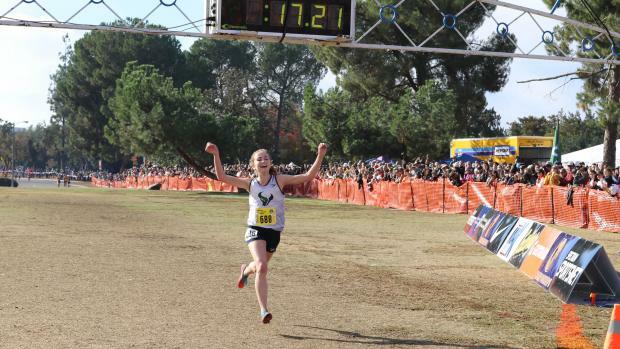 SAC and the San Diego Section championships after signing her National Letter of Intent to Stanford gave her confidence going into the race. And she still has some unfinished business. Completely healthy, she will return to Mt. SAC this coming Saturday for the Foot Locker Western Regionals where the top 10 finishers qualify for the Nationals a week later in her home town over a Morley Field course she knows well. One last demon to vanquish.